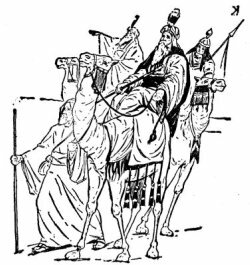 The Gift of the Magi - Listen Online! Have you ever gone to great lengths to try and do something nice for someone else? 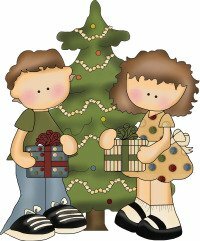 The Gift of the Magi is a short Christmas story about two people who sacrifice their most precious possessions to give each other the greatest gifts of all. Let's go on this short Christmas story adventure together! Click the arrow to listen to The Gift of the Magi Part 1. Pennies saved one and two at a time. Three times Della counted it. One dollar and eighty-seven cents. And the next day would be Christmas. There was clearly nothing to do but flop down on the shabby little couch and bawl. So Della did it. Which makes it all the more true that life is made up of sobs, sniffles, and smiles, with sniffles predominating. And look at this house! A furnished flat at $8 per week. It did not exactly need a description. It was surely run down and most things didn't work as they should. But whenever Mr. James Dillingham Young came home and reached his flat above he was called “Jim” and greatly hugged by Mrs. James Dillingham Young, already introduced to you as Della. Which is all very good. Della finished her cry and wiped her eyes with the kerchief. She stood by the window and looked out dully at a gray cat walking a gray fence in a gray backyard. Tomorrow would be Christmas Day, and she had only $1.87 with which to buy Jim a present. She had been saving every penny she could for months, and this was all she had to show for it. Twenty dollars a week doesn’t go far. Expenses had been greater than she had calculated. They always are. Only $1.87 to buy a present for Jim. Her Jim. Many a happy hour she had spent planning for something nice for him. Something fine and rare and expensive—something that Jim would be proud to own. Click the arrow to listen to The Gift of the Magi Part2. Now, there were two possessions of the James Dillingham Youngs in which they both took a mighty pride. One was Jim’s gold watch that had been his father’s and his grandfather’s. The other was Della’s hair. Had the queen of Sheba lived in the flat across the street, Della would have let her hair hang out the window some day just to show it off to the Queen herself! And then she put it up nervously and quickly. Once she faltered for a minute and stood still while a tear or two splashed on the worn red carpet. She put on her old brown jacket and her old brown hat. With a whirl of skirts and with a brilliant sparkle in her eyes, she fluttered out the door and down the stairs to the street. “Twenty dollars,” said Madame, lifting the mass with a practiced hand. “It's a deal, but do it quickly,” said Della. Click the arrow to listen to The Gift of the Magi Part3. For the next two hours she was ransacking the stores for Jim’s present with her twenty-one dollars and eighty seven cents in hand. She found it at last. It surely had been made for Jim and no one else. There was no other like it in any of the stores, and she had turned all of them inside out. It was a platinum fob chain simple in design, properly proclaiming its value by substance alone and not ornate decoration—as all good things should do. It was even worthy of The Watch. As soon as she saw it she knew that it must be Jim’s. It was like him. Quietness and value—the description applied to both. Twenty-one dollars they took from her for it, and she hurried home with the 87 cents. With that chain on his watch Jim might be able to properly check the time in any company. Grand as the watch was, he sometimes looked at it on the sly on account of the old leather strap that he used in place of a chain. When Della reached home her excitement gave way a little to prudence and reason. She got out her curling irons and went to work repairing the ravages made by generosity added to love. Which is always a tremendous task, dear friends—a mammoth task. Within forty minutes her head was covered with tiny, close-lying curls that made her look wonderfully like a truant schoolboy. She looked at her reflection in the mirror long, carefully, and critically. “If Jim doesn’t kill me,” she said to herself, “before he takes a second look at me, he’ll say I look like a Coney Island chorus girl. Click the arrow to listen to The Gift of the Magi Part 4. Jim was never late. Della doubled the fob chain in her hand and sat on the corner of the table near the door that he always entered. Then she heard his step on the stairs, and she turned white for just a moment. Jim stopped inside the door, as immovable as a setter at the scent of quail. His eyes were fixed upon Della, and there was an expression in them that she could not read, and it terrified her. It was not anger, nor surprise, nor disapproval, nor horror, nor any of the sentiments that she had been prepared for. He simply stared at her fixedly with that peculiar expression on his face. “Jim, darling,” she cried, “don’t look at me that way. I had my hair cut off and sold because I couldn’t have lived through Christmas without giving you a present. It’ll grow out again—you won’t mind, will you? “You’ve cut off your hair?” asked Jim, laboriously, as if he had not arrived at that fact yet even after the hardest mental labor. Out of his trance Jim seemed quickly to wake. He enfolded his Della. Eight dollars a week or a million a year—what is the difference? A mathematician or a wit would give you the wrong answer. The magi brought valuable gifts, but that was not among them. Click the arrow to listen to The Gift of the Magi Part5. White fingers and nimble tore at the string and paper. And then an ecstatic scream of joy; and then, alas! a quick feminine change to hysterical tears and wails. For there lay The Combs—the set of combs and brushes, that Della had worshiped for so long in a Broadway window. Beautiful combs, pure tortoise shell, with jeweled rims—just the shade to wear in her beautiful vanished hair. They were expensive combs, she knew, and her heart had simply craved and yearned over them without the least hope of possession. And now, they were hers, but the tresses that should have adorned the coveted adornments were gone. And here I have lamely related to you the uneventful chronicle of two foolish people in a flat who most unwisely sacrificed for each other the greatest treasures of their house. But in a last word to the wise of these days let it be said that of all who give gifts these two were the wisest. What Do You Think of The Gift of the Magi? What does The Gift of the Magi mean to you? Would you sacrifice your most precious possession for someone you love like in this story? Would you be disappointed if someone sacrificed greatly to get you a gift that you couldn't use? Jesus sacrificed his life for you - his greatest gift of all. How do you think He would feel if you didn't accept or use His gift? We Hope You Enjoyed The Gift of the Magi! If you did, you may also like these, we love the audio CD collections by Jim Weiss.